Is your agave infested? Look for damaged tissue where leaves meet stem. The lowest leaves will appear wilted, and may slope unnaturally downward while the center cone remains upright. The plant, no longer anchored by roots, will rock when pushed. When an infestation is well underway, it’s possible to shove the agave over onto its side. It’ll break at soil level, revealing a mushy, foul-smelling core infested by plump, squirming, half-inch, cream-colored grubs with brown heads. Above: an agave’s grub-eaten core resembles a sponge. Above: Close-up of a snout-nose grub. In my YouTube video, “Agave Snout Weevil Prevention and Treatment,” I demonstrate how to inspect nursery agaves, show resistant varieties, and interview agave expert Kelly Griffin at an infested colony of Agave americana. Kelly also talks about applying a systemic insecticide as a prophylactic (preventive) option. 1. Place a tarp around the plant. 2. Position a wheelbarrow nearby. Make sure the tarp covers the ground between it and the agave. 3. Dig up the agave and put in the wheelbarrow. 4. Dig out more dirt to a depth of 12 inches (deeper if you find grubs) and about 12 inches from where the base of the plant was. 5. As you transfer the soil to the wheelbarrow, inspect it for grubs and weevils. 7. Take the wheelbarrow to a paved area, like your driveway, so if beetles escape they’re easy to spot. 8. Transfer into heavy-duty trash bags, sprinkle contents with insecticide, and triple-tie. 9. Seal any rips with duct tape. 10. Drench the soil where the agave was with insecticide. Hire a licensed pest control expert. The going rate is $175/hr., but you’ll know for certain that everything is done safely and protects the environment while eradicating the pest from your property. One in the San Diego area is Chris Mizoguchi, chrisagpestcontrol@hotmail.com. 1. The night before, soak (hose-water) the soil at the base of each agave to aid penetration. 2. Read and follow the label directions. Be sure to wear gloves and protect your skin and eyes. 4. Agaves naturally funnel rainwater water to their roots, so if you slosh the solution where lowest leaves meet the core, you’ll effectively drench the soil below them at the base of the plant. Note: Avoid doing this in temperatures above 80 degrees F. High temps diminish the insecticide’s effectiveness and may even harm plants already stressed by heat. — Send close neighbors a friendly email with a link to this page. 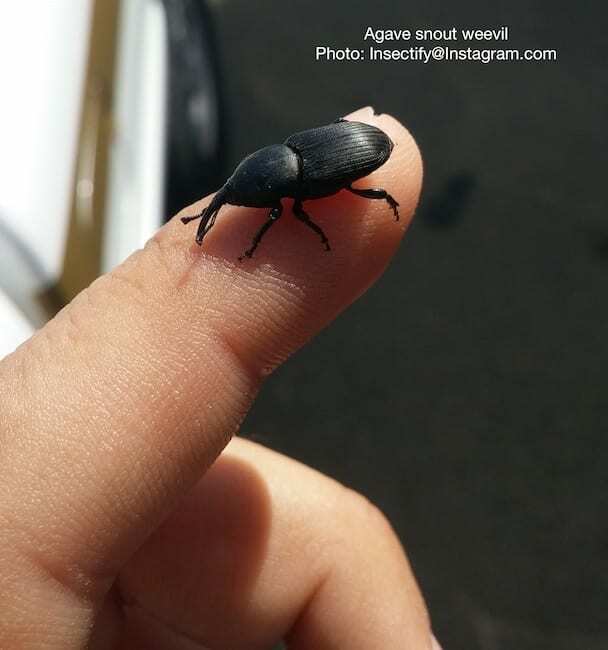 — Post about agave snout weevil on your neighborhood’s online forum. If possible, include a photo of an infested agave. Don’t assume your agaves won’t be affected. Although snout-nosed weevils can’t fly (yes, there are such things as flightless beetles), they sure can walk. I first suspected that snout-nose had arrived in my backcountry community northeast of San Diego when I noticed a collapsed Agave americana in a friend’s garden. I could barely believe it. She lives atop a rocky hill surrounded by acres and acres of native chaparral. Either the weevil had arrived via infested nursery stock (on a different agave most likely, seeing as the sick plant was part of an old colony), or it had walked in. I’ve since observed that it takes a captive weevil ten days to die despite receiving no water nor food. The entire time, it was mobile and capable of traveling 4 inches per second. Had I released it, it easily could have gone several blocks (at least). It also was a surprisingly good climber. Consider: If a dying agave hosts dozens of grubs that turn into beetles, and if each takes off in a different direction, one or more will certainly find another agave. A tiny concern. If your goal is to kill snout weevils before they spread, a systemic ought to do it, but it’s uncertain how much damage the puncture hole causes. The weevil is a vector (carrier) of Erwinia carotovora, a micro-organism that decomposes plant tissues, enabling grubs to easily consume it. I’m hopeful, and it seems likely, that the bacteria doesn’t go deeper unless spread by live grubs. Moreover, as I mention below (see “Good News”), bitten agaves have been known to recover. *GREEN ALERT: Insecticides may kill beneficial insects as well as pests and may disrupt your garden’s natural predator-prey balance. Snout weevils have coexisted with agaves for millennia and are naturally preyed upon by reptiles, birds and mammals (though the spines that protect an agave from predation also protect the weevil). Systemics, as the name implies, transmit insecticides through a plant’s system. Some studies have indicated that bees and birds are not harmed by the nectar of treated plants, and that animals farther up the food chain are not at risk. Even so, when a treated agave begins to form a bloom spike, it’s wise to cut it off before buds open. Use insecticides sparingly and follow label directions. Don’t pour the solution (or for that matter, anything inorganic) into drains or gutters. — An organic control currently being tested is a pheromone trap designed to attract adult beetles in search of mates. — Weevil-resistant Agave varieties do exist and are being selected and cultivated. (Sometimes you’ll see seemingly unaffected plants alongside diseased ones.) Tissue-culture labs make it possible to produce quantities of plants over a short period of time, which is likely the future of commercially-sold members of the Agaveaceae family. — The weevil seems less inclined toward those with thin, flexible leaves, such as Agave attenuata; those with tough, hard-to-pierce leaves (such as agaves desmetiana, murpheyi, parryi, lophantha ‘Quadricolor’, ‘Sharkskin’, triangularis, victoriae-reginae and vilmoriniana); and those with slender, nonjuicy leaves such as agaves bracteosa, filifera and geminiflora. See photos on my website’s Agaves page. An agave in Jeanne Meadow’s garden a year after being treated for active snout-weevil infestation. The weevil had consumed part of the core, but enough remained intact that the plant was able to grow new roots. Plant agaves bare-root. Before planting, remove an agave from its nursery pot, set the plant (root ball and all) in a wheelbarrow, and hose the soil from the roots. Examine the plant for beetles and puncture holes, and the soil for grubs. If a plant is infested, destroy it and inform the source nursery. Jeanne notes that when chased, weevils head back to the agave for shelter. “They don’t try to escape from the wheelbarrow.” Btw, after observing grubs kept alive in soil-filled jars, Jeanne says that when deprived of an agave to feed on, grubs don’t pupate (turn into weevils). Grow agaves in pots. In areas where snout weevil is known to be active, plant agaves in containers like urns. You’ll know that the soil is OK because it came from a bag; you can easily get rid of infested soil should beetles show up; and when you apply a preventative drench, only the soil in the container is affected. Additional advantages are that pots elevate agaves for better viewing, enabling them to serve as garden focal points even when small. Potentially immense, pupping agaves (such as A. americana species) grow more slowly in containers, which also serve to corral their offsets. The big green agave at left is likely a hybrid of A. salmiana; at right is A. franzosinii. In the foreground is what Jeanne Meadow calls “snout-weevil candy”: A. americana ‘Mediopicta Alba’. Watch susceptible plants. Keep an eye on all your agaves, especially mature ones about to bloom because they’re loaded with weevil-attracting carbohydrates. The pest seems to prefer specimens of Agave americana and its variegates (striped varieties), as well as closely related Agave franzosinii (one of the largest agaves). Reportedly, it may infest other genera in the Agavaceae family, such as Nolina, Beaucarnea, Yucca, and Furcraea. I’ve heard, but have yet to confirm, that it also attacks Mexican fence post cactus (Pachycereus marginatus) and possibly barrel cacti — but symptoms may simply be due to a different bug. After all, it’s a Pandora’s box out there. Hi Debra, Thanks for the article. I found one of my agave mediopicta alba plants was infested when it topped over as I pushed on it. The roots were completely gone and it had weevils boring into the bottom. Oddly, the top of the plant didn’t show many signs except the leaves were beginning to cup inward and it looked somewhat anemic. The nursery I purchased it from said this was common (I suspect they sell lots of infested plants) and told me to remove it and soak the plant bottom in a solution of water and liquid insecticide to kill the bug and then replant it. They referred me to Grangettos who they said would give me the products needed. I’m at work so I don’t have the exact product name but it was a Bayer product and basically a broad spectrum insecticide that kills everything. I soaked the plant as directed and put it in a pot treated with a granular formulation of the same product and left it there until it looked happy and started growing again. I lose track of time but this was probably 3 – 4 months. Then I removed it to find nice new roots and put it back in the ground where it was originally planted. I also treated the other plants with the granular product. Nursing it back to health in a pot may have been overkill. Hi Jeff — I’m surprised they told you to treat and replant it. Its meristem tissue must have been somewhat intact. The thing is, the weevil injects a microbe into the agave that softens its tissues, so that the grubs can eat it. I’ve never heard of an agave surviving that. I’m very glad yours did, but I’d hesitate to recommend others try it. Usually the plant is too far gone. UPDATE, Jan. 2018: I’ve since heard of agaves regenerating after infestation. Very good news! But of course if the core is too far gone, it’s best to destroy the plant and get rid of any beetles and grubs. I have my pesticide license and use systemic organic product that I would like to test on the snout weevil. If you are interested and if you find infected plants, email me and we can set up an experiment. Hi everyone — Tina is in Orange County. Wouldn’t it be fantastic if there were an organic systemic that was effective? Thanks, Tina, for the info. Please keep us posted! Hi, I need an infected plant to test. So far, there are no ASW’s on my Yuccas or Agaves. Imadacloprid is killing bees. It is one of the worst ever pesticides and will end up killing us also. Instead of that, purchase earthworm castings and spread them on top of soil surrounding agaves. Keep it up. Earthworm castings kill all insect pests and are a great barrier to the ones that live in the ground under plants. Weevils walk on top of soil and cannot cross earthworm castings or they die. This is because earthworm castings contain chitinase, an enzyme that destroys chitin. The exoskeletons of insects are made of chitin. I lost a couple of Agave Blue Flame recently here in San Marcos. I have two left as well as other, more susceptible agaves. I don’t like the idea of using chemicals/insecticides so I will start using earthworm casings. Thanks for the advice, Pat! And, keep up the great work Debra! !